I feel like I’ve watched Hoult grow up and become a great, young actor right before my eyes, something I consider myself lucky to have experienced. About a Boy, X-Men, Warm Bodies, Young Ones, Fury Road, Equals; kid’s got talent. I trusted him to take on a complicated role like this, even though the subject matter is a little laden and tends to lean toward the over-dramatic. 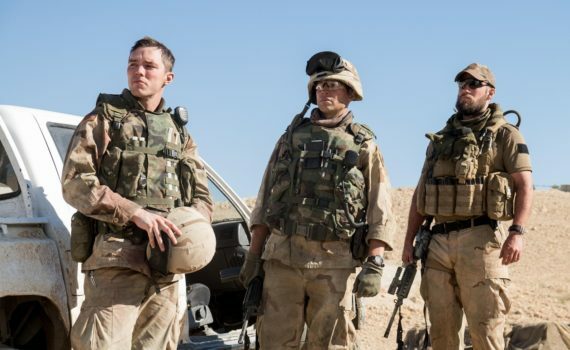 This isn’t the first time we’ve seen a film about the Iraq war, and it won’t be the last, but I was actually excited to see Hoult’s take on it, hopeful that he could do something unique with the standard shaken-soldier role. A mediocre result won’t destroy my faith in the guy, but I am disappointed that Sand Castle turned out to be just another take in a long line of takes and a movie we won’t remember for long. As the American invasion of Baghdad began, excitement mounted among the troops assigned to this most difficult of tasks. Some were ready for “their war”, some sought the action, some were prepared to do their jobs. A few, and count Private Ocre among them, just wanted to go home. Joining the Reserves to pay for college in July 2001, Ocre never imagined a terror attack would propel his country into war, nor that he would be fighting on the front lines. So while others around him are raring to go, he’s smashing his hand in the door of a Humvee, hoping that he can stay behind rather than enter a dangerous world that he has never been, and never will be, prepared for. I have enjoyed these three main actors in various films, but combined they were a level below the quality needed to pull off a film of this emotional magnitude. Hoult was a perfect scared Private, but he played the part one-note to a fault. Marshall-Green was a fine Sergeant, but just isn’t an Oscar-caliber guy. Cavill, who looked like a goddam badass, was under-used and turned into a caricature. All three were asked to use phony accents, two actors being British in real life, and the result was almost comical. Then add in that the plot was something we’ve seen a thousand times before, the dialogue built on cliched conversation that I hope to never hear again. The film was saved, perhaps, by its intent, and by the accuracy of its depiction of the complications of the war zone, but even that strength couldn’t cover up the variety of other weaknesses.